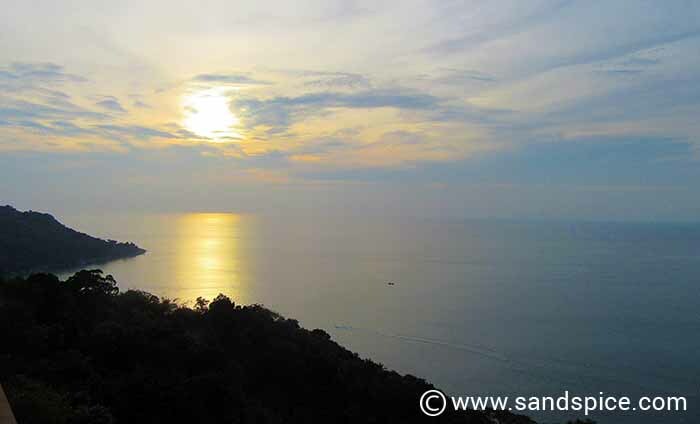 Our Malay peninsula west coast journey actually started in Phuket Thailand – just north of the Thai-Malaysian border. We wanted to use the flexibility of an open-jaw flight ticket to pack as many destinations as possible into our round-trip. Since we would be ending the journey in Kuala Lumpar, Phuket seemed to be a good starting point. With just 3 days on the island before heading on to Langkawi, we would try to make the best use of our time. With almost zero visa restrictions, it’s perhaps no surprise that Phuket has become a favourite holiday destination for specific countries. Russians in particular are prime beneficiaries of Thailand’s free-for-all immigration rules. In fact, many foreigners treat Thailand as a 2nd home, spending months in rented accommodation. This necessitates a periodic visa-run, typically a day-trip to Malaysia to renew the 30-day visa when re-entering Thailand. We shouldn’t have been too surprised then by the predominance of Russian tourists in Phuket. Cycling around the island – Beware the traffic! A great way to deal with cramped legs and jet-lag following a long-haul flight is to put in some strenuous exercise. Hiring a bicycle and cycling around the hilly roads of Phuket is a surefire way to get the circulation going. Apart from several serious 1-in-3 hill climbs, the only problem with this idea is the traffic. You’ll need to get up early in the morning if you want to avoid congested roads and polluted air. There isn’t much in the way of cycle paths either, so you need to take your chances winding in and out around people, lorries, bikes and roadside obstacles. On the plus-side, there are plenty of bike-repair shops (which we found really useful), and it’s a great way to get to know your way around the island. 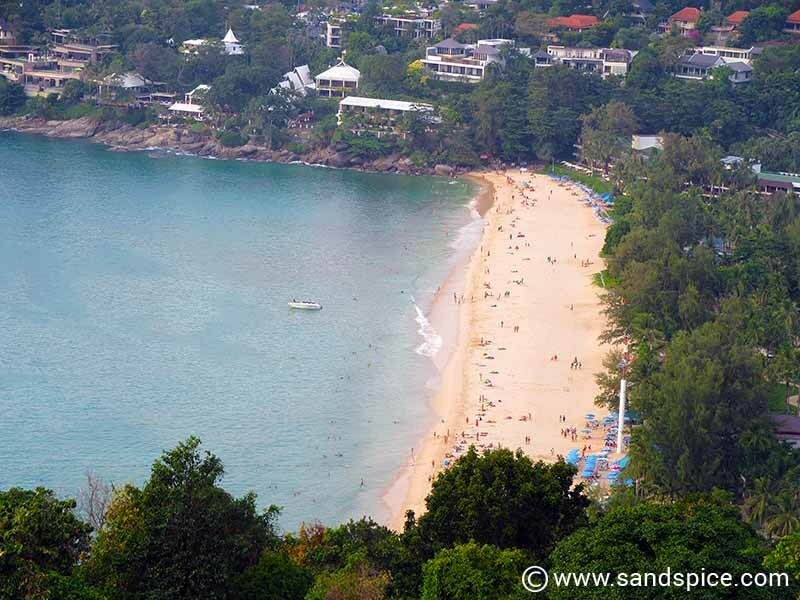 We found the beaches in Phuket pleasant enough, if a little crowded. Most beaches offer soft, yellow sand, and there are plenty of water-sports on offer. The sea is warm and calm, and deepens gently with safe, shallow areas for swimming. 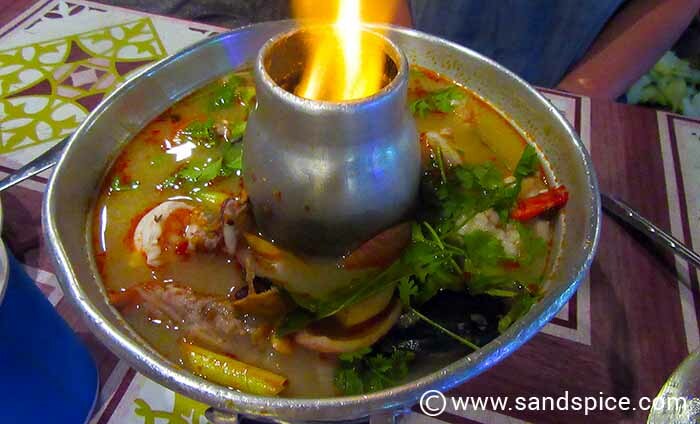 One of the highlights of a visit to Thailand – if not the highlight – is undoubtedly the food. Everywhere we ate the food was excellent. We enjoyed a meal for 6 with wine in the upmarket Heaven Rooftop restaurant. True to its name, this rooftop restaurant offers great views and spectacular sunsets. 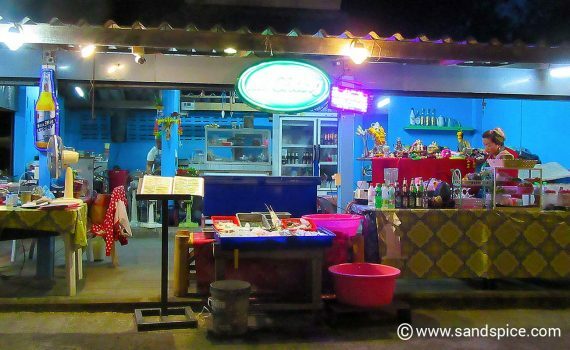 The price for eating at this location was 5,203 baht (€135) – around €23 per person. 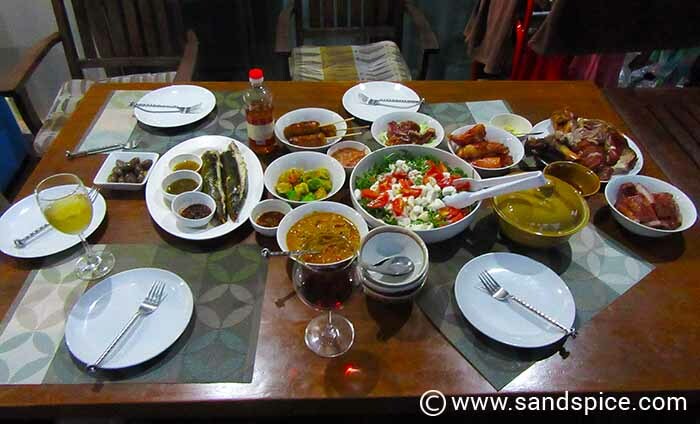 A similar meal in a more modest beachfront restaurant the following day cost around half the price at 3,030 baht (€79). If anything, the food here was even better. 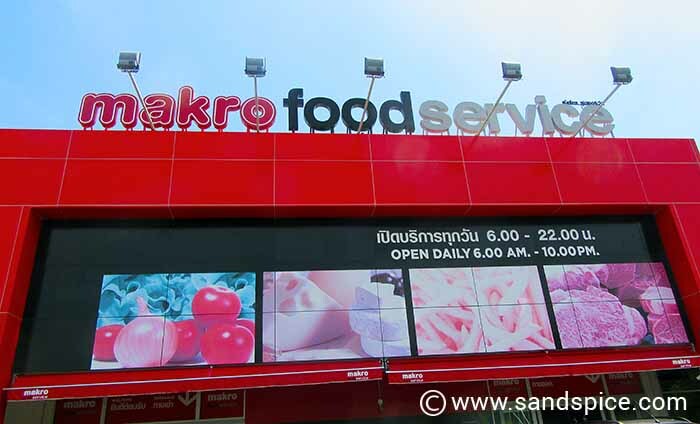 Doubtless because of the popularity of Phuket with western tourists, there are several large supermarket chains which cater very well for western tastes. These include Tesco and Makro. The Big C Supercenter is also worth a visit. Unlike most of the cities we visited in Malaysia, the supermarkets in Phuket stock a wide variety of western food products. So if ever you start hankering for the tastes of home, you can find most of what you’ll need at the nearest hyper-store. It’s hard to miss this giant white Buddha, perched on the top of the mountain above Chalong Bay. 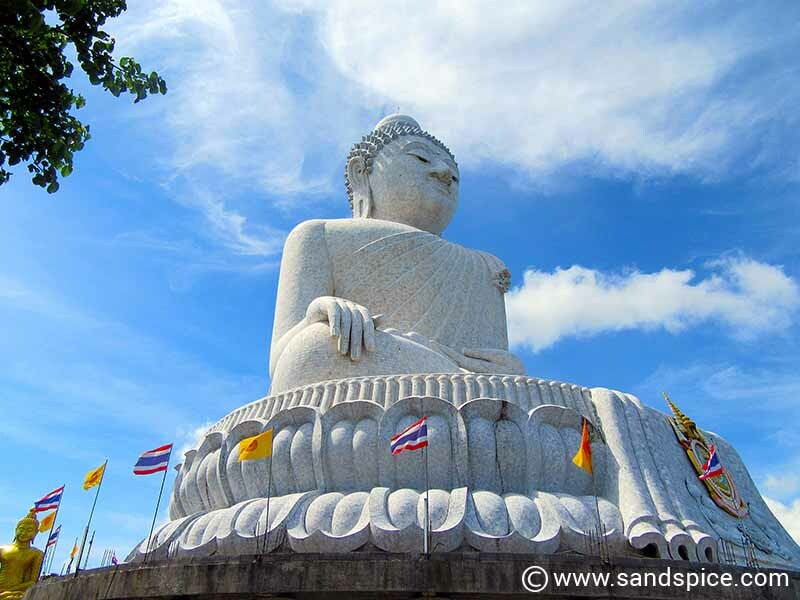 It is a 45-meter tall white marble statue, visible from anywhere in the southern part of Phuket. Mostly built on visitor’s donations the Big Buddha is a bit of a tourist circus, but it offers some excellent all-round views of the island. One of the coolest features of a visit to the Big Buddha is to try your skill on one of the resonance gongs. The trick is to rub the inside of the gong lightly and rapidly with your fingers. You need to be patient, but when you do it correctly, the gong emits a deep and loud resounding signal. 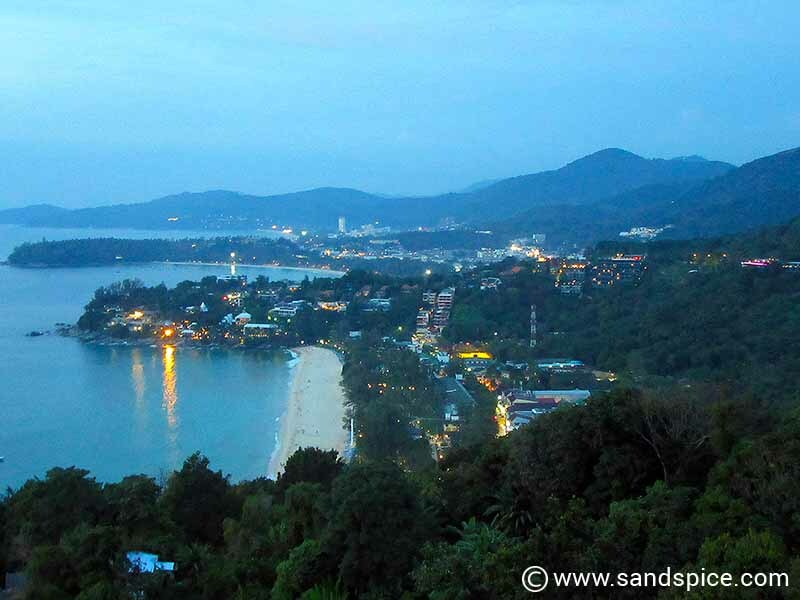 Travelling between the airport and the primary beach areas of Phuket takes a good 45 minutes when there is no traffic (early morning or late night). At any other time the journey can take twice as long. Add to this the massive security-check queues at the airport, and you’d better give yourself an extra couple of hours when leaving to take your flight home. You also need to make sure you’ve kept that little slip of paper they gave you when you entered Thailand for the first time. If you don’t still have it in your passport when you return to the airport to leave, you’ll have an even bigger delay and could miss your flight (it happens…). For a long stay in Phuket, why not do like the Russians? Rent a 3 or 4-bedroom villa for 3 months to avoid the worst of the winter back home. Share your costs with a few friends, and your monthly rent can be as little as €500-€600 for 2, including all facilities and private swimming pool. With a pleasant open-deck area, you’ll never need to actually cook anything. Just pick up a selection of cheap and tasty local food from one of the markets, take it back to the villa and enjoy dinner in front of your own pool. Following our 3 days in Phuket, we would be taking an AirAsia flight south to spend a week in the tropical island paradise of Langkawi. Initially, we did consider taking a boat across from Phuket. However, a little research indicated that the boat trip would cost about the same as the flight – and take even longer to arrive. There would also be some hassle arranging entry visas on an intermediate island before continuing on to Malaysia. All in all, the flight to Langkawi seemed the better option.